I've had an iPhone since the 3GS (I have a 5S right now) but I'm always flirting with the Windows Phone. It's just prettier than my iPhone, but my iPhone has a lot of apps...so I stay with it. Folks tease me at work and at conferences for not using a Windows Phone. I always say "when it's an awesome phone platform, I'll use it." Man, Windows Phone 8.1 is definitely more than "point 1 better." Seriously. It's the platform Windows Phone should have been from the beginning. From a general functionality perspective, this 8.1 update brings the Windows Phone (finally) on par with my iPhone 5s, and in some cases, takes it beyond. It's REALLY tempting now. Notification Center - Finally. Swipe down from the top and get notifications in one place. Just like an iPhone you get quick access buttons for airplane mode, wireless, etc. Even better, those buttons are configurable. I added Internet Sharing to mine. You can also swipe down then press Settings as a fast way to get to the main settings page. Transparent Live Tiles - You can use a background image for your whole start screen, and it will show through transparent tiles. It also has a nice parallax effect when scrolling. Check it out in the video below. "Show more Tiles" on smaller resolution devices - The 1520 on the right has the 1080p screen, while the 920 is a lower resolution screen. Previously only high-res screens got the extra column of tiles. Now smaller screen devices can choose their start screen size and add LOTS more info to a single screen. Pinnable Website Tiles - This one surprised me. I recently added support to my blog for IE11 Pinned Tiles, so you can pin this website to your start screen and get an updated Live Tile showing the latest stories. I talked to the front end developer at The Verge and he added the feature for theverge.com as well. His implementation is REALLY impressive. The surprise was that Windows Phone 8.1 now supports that same technique and I didn't need to do anything. See on the 920 on the right, at the bottom, that's a pinned flipped tile showing a story from my blog. Very nice. Cortana Voice Assistant - You could say this is the Windows' Siri, but it's more like Google Now with a personality. The voice recognition happens as you speak as opposed to after the fact, which is nice. You can ask questions like "How old is Oprah" and she (or he) just knows. You can say "Call my wife" and she'll say "Who is your wife?" then associate a contact with that nomenclature. Quiet Hours - I use Do Not Disturb on my iPhone. Quiet Hours takes this a little further with the concept of an "Inner Circle" and a more sophisticated series of configurable rules like "Don't bother me at night on weekdays unless it's these three people, and text everyone else back that I'm not answering calls." Driving Mode - This was added in a Windows Phone 8 update but I love it. It knows you're driving because you associate your cars' Bluetooth with it, then it will text folks "I'm driving, I'll get back to you" if they text you. You can choose to never see the text until you stop. Very cool. Keyboard Swiping - It's built into the main keyboard now, no separate app. The predictive text has gotten better as well. Battery Sense - The phone can tell you what apps are eating the battery, and when they are eating it. It'll show if the battery is being used by apps in the background or in the foreground. I recorded a video on a real phone (the 1520 above, in fact) and demonstrated a LOT of the new feature. Check it out as part of my Windows 8 YouTube video playlist, or embedded below. I used the Project My Screen app (MSI) and turned it on in Settings on the phone, connected with USB. Go register free at http://appstudio.windowsphone.com. Then go to "Windows Phone Preview for Developers" and install the "Preview for Developers" app. Go to Settings, then System Update and update your phone. Depending on how up-to-date your phone is, this might take 2-3 visits. One of my phone needed just one update, another needed 3. It'll take 10-15 min. If you get the Preview today,your phone will update to the final version automatically, I'm told. Go check it out! Sponsor: Big thanks to Red Gate for sponsoring the feed this week. 24% of database devs don’t use source control. Do you? Database source control is now standard. SQL Source Control is an easy way to start - it links your database to any source control system. Try it free! My main problem is that there is no hardware out that I like. I want something light. That is my main criterion. Light and thin. As light as the iPhone, so say 112 grams. There is just nothing even close out there for Windows phones. The whole trend seems to go to bigger screens, which is something I really don't care about. The whole thing is actually a total mystery to me. You would think that SOME manufacturer would try to provide something with those specs for Windows phone. Isn't the whole idea here that one can get the best OS on a wide variety of handhelds, so that everyone finds something for his or her liking? But all I see is a drive for bigger screens and better cameras. Why isn't there at least one low weight phone in the windows ecosystem?!? So, I'm stuck on my Samsung Focus, which is at 119g, which is not bad but also not great. The software of course is really showing its age. I REALLY hope that once MS owns Nokia, that they will provide one model in that category. Goes the right way. Especially Cortana seems promising. Maybe you can flirt with an Android phone too? No matter how good a mobile phone OS is, if the majority of popular apps are not on it, the OS doesn't matter much. It will be an isolated phone whose longer term usability will wear off soon. I used to have a Windows Phone 7 and I would get disappointing when a popular app I felt is useful to me was not available. I switched to Android and I am happy with how open it is and the number of app options available and how easy it is to sideload apps. SwiftKey is a cool keyboard replacement app. iOS doesn't allow keyboard replacements. I don't know if Windows Phone allows them. I bet SwiftKey with a whole company behind it is going to beat any OS built-in keyboard. The fact it's a separate app has no bearing because it's totally seamless across all the Android apps. That's a big win for Android. Still, good job for MS in continuously improving WP and not giving up. Davidacoder - The 925 is only 139grams, compared to an iPhone 4 at 150grams and iPhone 5 at 112grams. Upgraded both my and my wife's Lumia 928s on Monday. Loving all the subtle improvements so far, with the swipe typing alone being reason enough to upgrade. Cortana is cool, though I don't know that I'll ever use it enough to really take full advantage of all the features, voice control is just not for me. Works great for setting reminders, though. As far as apps, all the major ones that I care about are there (though the Flickr app looks like it hasn't been updated since WP 7 - still works, but doesn't integrate with some of the newer social features). The "quick settings" on the notification screen are great, though ostensibly the most useful toggle, cellular data, is presently not available as an option there. Overall, I think it's a great update to an already strong platform and definitely worth a shot. The things people spend most of their time on a smartphone doing (taking pictures, texting, using social media and browsing the web) are all best in class experiences. I think the "lack of apps" is mostly a myth outside of goofy vendor specific things which are generally just website wrappers anyway. That is almost 25% more weight than the iPhone 5. That is HUGE. The iPhone feels like an elegant, small device, the 925 like a big, heavy thing (in comparison). I want something light. 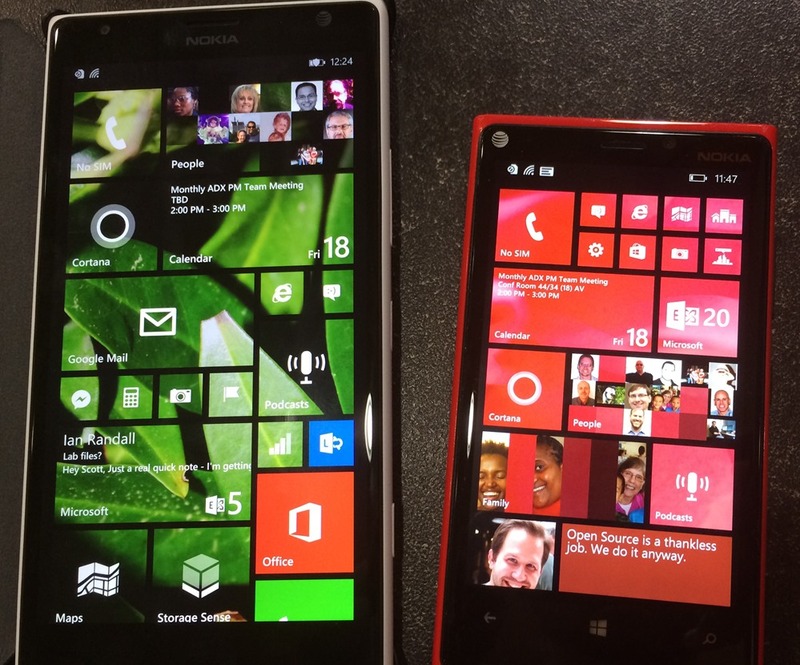 Can't there be one, out of the gazillion (well, dozens) Windows phones, that matches the iPhone on weight? With the exception of a few cons like the ugly Metro UI with its huge header/title text, WP is getting there slowly. Here's a few of my qualms. 1) Lack of Information density (those huge header/title texts is a big big problem, taking up 1/3 of the screen real estate. 90% of all Metro apps look the same, no personality, using the same pivot template (which is really a tab control) with the large panoramic header text that is partially shown and all those blocky rectangles. 2) App list is a mess...no way to group app into folder. Titles of some apps are render in huge text that, if they are too long, some of the header gets cut off. The search icon on this All Apps screen is at the top left, violating the same Metro paradigm that places the search icon on the lower command bar. 3) The UI transition in WP is ugly and slow, with tiles slowing flying away on the start screen when u tap on an app. Transition should be a smooth fade in and fade out, almost flipboard'ish. 4) Live tile over-kill. The start screen should scroll horizontally just like Windows 8, Android, or iOS.. Instead of freely scrolling the start screen, it should be paged. What's the benefit of live tile if it is off screen? There should be a quick launch bar at the bottom where user can pin their app (not the same as pinning live tile. The spacing between tiles should be slightly increase cause WP8 looks like a clutter mess. Overall, Metro UI needs a big time makeover. Yes, the guts and basic functionality are being baked into the OS, but users love eye candy and this is where the battle is. Google and Apple iterated their UI...now it's MS time. For me, the notification panel and the distinct alert sounds for each email account make it complete. Plus the Lumia Icon has a super camera and a beautiful screen. I'm not a really big app user so I don't really miss any. I've been with Windows Phone since the HTC8X and 8.1 really made my day. "Notification Center - Finally. Swipe down from the top and get notifications in one place." My Samsungs have done this forever. "Transparent Live Tiles - You can use a background image for your whole start screen, and it will show through transparent tiles." Some widgets have transparent sections, so again this has been on my Samsungs forever (and you can also have live backgrounds if you hate your battery). "Cortana Voice Assistant - You could say this is the Windows' Siri, but it's more like Google Now"
"Quiet Hours - I use Do Not Disturb on my iPhone. Quiet Hours takes this a little further with the concept of an "Inner Circle" and a more sophisticated series of configurable rules like "Don't bother me at night on weekdays unless it's these three people, and text everyone else back that I'm not answering calls." I've used Blocking Mode on my last two Samsungs. It also allows a contact list of people that can get through. "Keyboard Swiping - It's built into the main keyboard now, no separate app." Samsung comes with Swype as an option. Has for years. "Battery Sense - The phone can tell you what apps are eating the battery, and when they are eating it. " It's nice that Windows Phone now has the capabilities of a Samsung Galaxy S2 (except for the selection of apps). But, I guess this list shows how truly behind Apple is these days. David - I guess I'll need to go feel my iPhone 5 and iPhone 4 again. I don't notice a major different. @davidcoder - you're going to have to hold on to that iPhone 5 since Apple is hotly rumored to be going bigger with their next wave of phones. I personally would love a bit more weight if that meant a bigger batter and wireless charging. @Abdu - things have changed since the Samsung Focus. A significant majority of the mainstream/popular apps are on Windows Phone. Candy Crush is not. If Candy Crush is your concern than do not get a Windows Phone. If you must have the latest fad apps, I'm not sure why you haven't gone iPhone...they get apps MONTHS before Android. @PRMan - ALL of my tiles that show in the main section of my start screen are transparent. Cortana goes beyond Google Now is areas. GN doesn't have People-centric reminders. Google Now doesn't keep the data mined from email LOCAL and off Google Servers. Wordlow swipe typing is more accurate than Swype and faster too. A low end Windows Phone just beat a big fancy Samsung for the World Record. I'm not sure why you feel the need to minimize what Windows Phone has done, but if you enjoy your Samsung, enjoy it. It's not a religion - no one is forcing you to convert. A little investigation would reveal however that Windows Phone has taken steps to move beyond the competition. I'm sure the competition will respond and that is why competition is great. Although it is meant to make background pictures possible for live tiles, I find them more or less confusing. I love the clean design of unicolored tiles on my screen. Through vibrant colors that I can choose to my very own taste, I can express my emotions without the start screen distracting me from what it is meant for: Supporting me in getting my things done very fast and then get back to real life. However, I found out that they are are great feature nonetheless. Because I can create unicolored pictures, I can circumvent the useless limitation of only 20 colors Windows Phone makes me choose from and can set virtually ANY color I want for my live tiles after all! I developed a little Windows Phone 8.1 app that takes on the business of creating an image with the correct screen size. This way you have the color of your (real) choice at your fingertips (literally) and have your live tile color changed in no time. Great for corporate identities! Christian - Try some of the stock photos...I'm finding that faces don't look good, but close ups of flowers, etc, do. Like the examples in the picture. By the way, I projected my screen with this "Project your screen" app. @JD That's why I said "a popular app I felt is useful to me was not available". I don't care about fad apps which are mostly games. In fact I don't play games at all on the phone. I read emails, RSS feeds and tweets plus a handful of utility apps. Another reason why I got the biggest phone (Galaxy Mega) which is Android only. Compared to most people I have a lot fewer apps but when I want an app, I want it. I remember when I switched away from WP, Waze wasn't available and it was already out iOS & Android for many months. After several incidents like that, I decided it was time to switch. As they say, something needs to be 10 times better for a loyal customer to switch. So Scott, why do you think this took so long to get here? I apologize for a rambling email I sent to you a few years ago harping on the fact that I could not simply navigate to a contacts address using turn by turn navigation. I was perplexed that this feature was on WinMobile years ago, but not WinPho 7 when it first appeared. Do us little people (who don't know how to code), simply underestimate the difficulty it takes to create this stuff? Were we just being impatient? Was MS building a mountain from the ground up and they simply could not get this stuff in from the start? Or do they really move so slowly up there at MS that 3.5 years is an acceptable time to wait? I'm very happy the wait is over, and I really hope the apps start raining down. Scott, I noticed, the ProjectMyScreen App is developed using C++ and DirectX. Nice one. However, I hope it is planned to include a record to disc feature. Do you know anything about further development plans? Are updates controlled by AT&T or Microsoft? I had a Lumia 900, and the update lag was intolerable. Worse than Android. I currently have an iPhone. The Windows phone looks great. And in the desktop space, I like Microsoft software (including Windows) far better than Apple software, so it would be nice to be 100% in the Microsoft ecosystem on both the desktop and mobile platforms. But until the app selection on Windows phone is at least comparable to what's available on iPhone, I won't seriously consider switching. Hi Scott why don't I have Facebook in the notification/action centre? It still only displays the live tile count. I'm using the official FB app now (previously been using FB beta). How do apps get added to notifications? Thanks! I want a Windows phone badly, but how do you get around the lack of apps that you use every day? For me it's apps like amazon cloud player, google hangouts, and marvel unlimited. I know those are very specific examples, but what does one do? Man, I'm waiting for the Nokia 930 but then found out that Cortana isn't coming to Canada. I haven't gone from excited to depressed as quickly as that since I don't know when..
Much like Scott, I've been and iPhone user since the 3GS. I used Windows Phone 7 for a brief while before the 5 came out and loved certain aspects of it. It's definitely coming up to par with iOS and Android with regards to features. The killer is the app ecosystem. The first party apps that exist on iOS and Android are so much better than the knockoffs that used to be in the marketplace for Windows Phone. If the app ecosystem starts to level off as well, I could see myself going back to Windows Phone. Some of the really simple things like pinning groups of contacts or individual contacts to the home screen were so convenient. I just always felt I was lacking an apps here and there. Maybe that's changed in the last 12-18 months. I hope so. Canada isn't supported in the developer preview, but I don't think we've announced anything else about availability. I wouldn't make the assumption that it's never coming to Canada. The new changes sound pretty nice but after waiting a year I recently sold my 920. The phone was beautiful. WP8 itself wasn't bad, though 8.1. sounds pretty nice. My gripe was the app store. The ecosystem isn't quite there yet (at least it wasn't too weeks ago) and Microsoft really needs to continue to work to get app developers more invested in the platform. They also badly need to better curate the app store and promote applications. I always found it a disheartening experience to open the app store only to see junk apps climbing to the top. I'll be keeping an eye out - a few more killer apps and maybe I'll be back at some point. davidacoder - probably time to let go of that small form factor, it's already a thing of the past, even more evident that we're talking about the form factor of an iPhone here. Phones are phablets now, and that's the direction they'll continue to evolve in. Even Apple is realising this. Probably time to stop justifying why to stay on the slowly eroding IOS and hop into the future. Apple is so old school and uncool now it's not funny. Those cutting edge days are long gone. I'm on a Lumia 1520, yes its massive, but combined with WP8.1 this truly feels like a leap-ahead device. Absolutely loving it, and a real experience to use every single day. PS some of you folks here are talking about WP7 and basing opinions off it. WP7 may as well as have been a different OS. A **LOT** has changed since then. Give things a go again folks. And even without Cortana (french here, no Cortana available yet), the update makes my 18 months 920 is looking like a new phone (not really sure I will change in near future). Windows Phone is nice; my dad and mom have been using it; especially the Hub concept (People and Pictures); they can stay connected; Metro UI is natural to them. Worked on a Lumia 625. I just wish that "Project your screen" app had Keyboard input. Is there a way to link live tiles to permalink? So that when user clicks on it, it takes user to that article instead of the homepage? What about transparent tiles for pinned site? Also, I hope they fix all IE11 issues with rendering and animation. There are few new CSS3 features but rendering and animation gotten worse over IE10. I had an i Phone first and then a WP 8 for a very short stint. There are simply no good apps available. I now have a Samsung Note 3 and I can honestly say I will stick with future versions of the Note. It destroys all competitors in just about every aspect. One of my favourite things is reading mode in IE. It worked great on all sites that I tried it with until I tried this site. All it shows is the disclaimer. Have you had a look? Windows Phone 8 is my crackberry. It is my "work phone". The way it handles email, office docs and social media in a way that strips away the android eye candy leaving me to focus on just responding to events is just awesome. The increase in tiles and display real estate is just awesome. I tell people it is the iPhone replacement and has a higher uptake in Uganda amongst te BYOD and business phone crowd in Uganda. 1) Huge header/title texts and all those blocky rectangles. --- Yup, hate those huge blocky rectangles inside any apps though it depends upon how the app is designed. 2) App list is a mess. No way to group apps. The search icon on All Apps screen is at the top left, violating the same Metro paradigm that places the search icon on the lower command bar. --- Could not agree more on every single word!! The app list needs much revisiting. 3) The UI transition in WP is ugly and slow, with tiles slowing flying away on the start screen when u tap on an app. Transition should be a smooth fade in and fade out, almost flipboard'ish. --- I like the WP transition effects. But hate the loading animation. 4) The start screen should scroll horizontally just like Windows 8, Android, or iOS and should be paged. --- THIS! Wouldn't it be easier to swipe left right and access the tiles! There should be a quick launch bar at the bottom where user can pin their app. The spacing between tiles should be slightly increase cause WP8 looks like a clutter mess. 8.1 improvements to UI and customization is very nice indeed, but have you seen Themer on Android ? It is quite frankly amazing! You can get a glimpse of it here. I am in no way affiliated with them, just a happy user who like to drastically change my phone look&feel from time to time. I've been using Windows phones for several years now. I love the latest updates. They make a great phone even better. I've tried using other phones, but they seem clunky and slow compared to my phone. And Nokia hardware is second to none. @davidacoder: I use the HTC 8XT (one of the few Sprint phones). It's 120g. I haven't had any issues with it from a performance standpoint. It feels lighter than any iPhone I've ever held because they're all in cases and I don't keep my phone in a case. I have had the 1520 for a month now. It is gorgeous. Yes, it is a little big, but you will get over it. I also installed the 8.1 dev preview on it. It is still rough around the edges with lots of tiny bugs, but I am sure it will get better. The big thing about the windows phone is you don't get access to the latest fad app like "Candy crush" or "Clash of clans". I am still waiting for the Fitbit and the Vonage apps, but I am fine without them. iPhone Do Not Disturb will let people on your Favorite list through with call and text. Text selection has become so bad I regularly curse now while typing on the phone because the tap and hold doesn't create the cursor anymore which could be freely moved in a text box. I'm really really angry about that! Also, I don't know if it's a preview issue (hopefully) but no videos will play anymore. I get the audio, but the screen freezes. Back button or home button still work to get me out of it. Also hate the dual volume controls... big step backwards IMHO. Christian - Try using Bandicam, it is way better than Camstudio in terms of frame rates and performance. It's WP, what else could you expect? There's still no file manager, and the only unique features I see is related to tiles and that's it. Thing is that WP will never be the Windows of the PC unless MS changes it's strict policies and restrictions on WP. Windows for PC succeeded because of the flexibility and the "wild west" that you can get on Android today. Doug - Unless you don't have Cortana (outside the US and haven't changed your region to it), the hands free texting is even better. Instead of holding the home button, hold the search button and say "Text my brother I'll see you in a little bit." You can set nicknames for your inner circle and Cortana will recognize what contact you want to do what with. Windows Phone 8 was released little over 1½ year ago, take this in to count when you say iOS and Android had this and that ages ago. Pramod and jamesb - App list is a mess...no way to group app into folder. Nokia has an application named App Folder. Not sure if that is what you are looking for, but it works well for me. Just recently Nokia made a huge update, for a while we did not have the ability to zoom in/out while recording video for any of the Lumia devices and drove many to the point of frustration. Today I received an alert that a new version of "Nokia Camera" had been released to the store that solved this problem. It not only solved the problem it gave me access to features I had no clue was missing. Including full control of white balance and timer for regular camera mode. After making this happy discovery changed my settings to make this my default app for the camera. And so can you. When in settings swipe to applications and locate "Photos & Camera"
scroll down until you find Default Camera app and from the drop box choose "Nokia Camera" this will override the default that says "Microsoft Camera". Thank you to the team at Nokia for solving a mystery, you just made my phone take that extra leap to happiness! Bloody hell!!! There are so many people moaning about the lack of apps on windows phone and how much the bleeding phones weigh. Why do you even bother? You clearly can't appreciate European design. Look, If you would all take the time to learn the OS and stop looking at it with the eyes of an iSheep or a Fandroid, and just approach it with an open mind. Everything in the consumer world is designed differently, each to the company's vision and design doctrine. And they all excel. Windows Phone is not designed to be an IPhone or Android replacement, it is designed to be a Windows Phone. Is a VW designed to be a BMW or a Mercedes? No. A VW is designed to be of a high quality but cost less to buy and much less to operate. A Nokia device is designed to be of a high quality, but cost less to buy and to own? They are also built to last. I know that because of contracts and upgrades, many don't realise that Samsungs and iPhones have an expiration date on them, as the not only have a lower resale value than legacy Nokia's but the are destined to spend time in the cell phone grave yard of eBay. While everyone is spending more to buy a Galaxy or an iPhone ( you still are paying for it in your contracts) and then spending huge sums on subscription fees. Although most of the updates in WP8.1 are great I can't help but feel some of the great unique features in WP have been lost. At the moment the hubs have pretty much disappeared, there is no longer facebook messenger integration in the messaging hub when I was expecting an API for all apps like kik, whatsapp, skype... to integrate more closely if anything giving us continuous conversation no matter the medium. Pretty much the same story for the pictures hub, perhaps this will change later when API's are available. The other annoying thing for me is now games show in the App list not just in the games hub as before which was a nice logical separation it also had a coll feature of showing the last 3 used games at the top which covered 99% of my usage. The games hub now updates on every load making it too slow and useless. I want the old functionality back or even better a second swipe left for the games list. I'm pretty sure that an iPhone has a much higher resale value than a Nokia Windows Phone. I'm not sure where you would read that is otherwise. iPhone has always been considered one of the tops if not the top in terms of quality. It's weird that you could somehow perceive one of their known strengths as a weakness. I've had an iPhone since the iPhone 3g. I've tried a couple of different Android phones and they just didn't "take" I'm seriously considering the Nokia Lumia Icon now. I think the apps in the Windows Phone apps store are sufficient for my liking and honestly I'm bored with the iPhone. @Darrell I didn't read anything any where. I am an experienced buyer and my customers always want mobile phones. and in my experience, like I said, Nokia Legacy phones, (not Lumia) have a very high resale value. The Nokia N8 has high resale value. It was one of the first devices with Dolby 5.1 surround. It also had the first xenon flash. it came with an FM transmitter, 12MP camera, Pentaband GSM, HDMI connections(the first with it) dual charging points, the first with Clear black display etc etc etc. They are very high on the resale market because they have many things in side. Thats why I still have mine. I have been tasked to buy the iPhone for my customers and that same iPhone 3g you sued to have develops faults, such as black spots, missing pixels, non working WiFi and other components. The iPhone has a good quality outer design but the components are second rate compared to Nokia phones. It is the same issue with Korean brands. They don't last long. I stick with Nokia because you get forward thinking, quality and a lot more for your money. Nokia likes placing easter eggs in their phones. @g3v you're being a little intellectually dishonest, no? Windows Phone 8 isn't a whole new operating system. It was built on top of WinPhone 7, right? Also disregarding Kin and WinMobile here. Microsoft isn't new to mobile. That said, I think Microsoft is getting closer to realizing the goal that was interesting about the Ubuntu Phone project: the ability to dock a phone and have a desktop. Yes, Motorola and I imagine others have tried it, but Motorola's implementation, I believe, was more or less just screen mirroring with laptop peripheral support. Ubuntu and WinPhone seem to be going in the right direction here. Will it replace your gaming desktop? No. Will it allow you to do some "lighter" work in a pinch? I hope so. And for those that don't want a gaming desktop, it could eventually lead to having one device to do all of these things, which isn't bad, especially for those that can't afford various form factors. You mention pinning Internet Sharing you your Quick Actions list. Another really neat trick of Windows Phone (introduced in WP8 GDR3) is that you can pair your phone via Bluetooth to your Windows 8.1 tablet or laptop and then activate sharing just by connecting to the phone's hotspot from your computer--no need to manually enable sharing on the phone first! Useful, I didn't know about Swyping on Keyboard. I really missed this feature from Android. Super useful. - S: What's the weather looks like today? - S: What about Boston? Thanks for this great summary video about the Windows Phone 8.1 update. I love the update. It also gives us developers many additional opportunities! I have been looking at these windows phones for a while. I have had a bad experience with Windows 8, but since I updated to 8.1 it has been working much better. Now, I will look at windows 8.1 phones more closely. Little late to discuss, but there's one thing that just irks me about Windows Phone (Nokia primarily): Exclusivity. I imagine there is little control Nokia/Microsoft have over this, but it is frustrating that you have 2 flagships (Lumia 1020 and 1520) which for all intents and purposes are exclusive to AT&T (I suppose the LTE bands may work on T-Mobile, unsure, haven't looked). You then have the Lumia Icon which is exclusive to Verizon. I was pretty happy when I saw the Lumia 930 as I'd pay full retail for that, except it doesn't work on AT&T's LTE. The moral of the 1020/1520/930 bit being that these devices are pretty disparate: 1020 is for photo takers, 1520 is for the phablet crowd, and the 930 to steal from Goldilocks and the 3 Bears is "just right" (though I guess you could say it is the high specced device that hits in the 4.7-5in sweet spot that a lot of people are into). Until they're more universal a la iPhone, HTC, and Samsung, it is too much effort to get interested in. I don't have to have the latest and greatest, but while I like the Lumia 930's look and build, a lot, I won't be switching as the only real option is Verizon, and forget paying $130/month for 2GB of data and unlimited text/voice that you're forced into (really, I use maybe 500 minutes a month and that's generous). Lumia 930 with AT&T's LTE spectrum being supported? Would be awesome. However, even then I'd almost bet it would be a carrier branded one and considering I use MVNOs, that's pretty useless to me (not sure if carrier bloatware is on WP devices or not, but even still, having the carrier branding for a device I'd want to be "global" and would pay outright for seems silly). Well, you can get Cortana to work if... you set your phone's region to United States. The downside is that it'll change everything to English (not much of an issue if you're in an English speaking country...) and all the Bing apps will also assume that region. But, with the exception of Bing search, you can manually set the region in each individual app to whatever you like. Also, Cortana's weather forecast is in Fahrenheit, and you, as far as I can tell, can't change that. The thing with Bing Search assuming you're in the US is even sillier, it should assume whatever my current location is. Because, you know, I want relevant results even if I'm just visiting some other country. Something I do often, what with the fact that Spain is just a two hour drive from here. Also, the swipe keyboard is... odd. It works fine if I set it to PT-BR, but doesn't work if I set it to PT-PT even though the layout is exactly the same and the differences between both variants are minimal, way less than, say, between EN-US and EN-EN. That said, all in all, this feels more like Windows Phone 9 than 8.1. Scott, I really *want* to respect you as a Microsoft evangelist, but the WP thing makes it very difficult. When you wrote your app and released it other platforms first, I lost a lot of enthusiasm and respect. You need to know that some people receive a message from you that you may not be intending to send. Maybe it shouldn't matter, but it does.